If your event runs longer than 4 hrs the price should change during the checkout process. 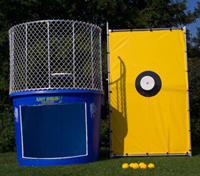 Regual rate for a Dunk Tank is $ 335.00. Sister, Local Politician, Sport Personality in the water.